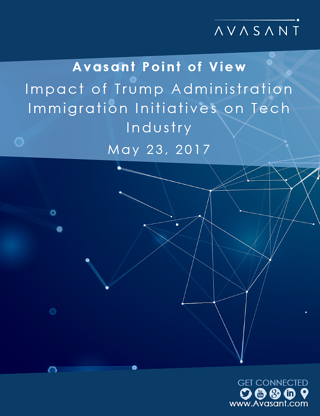 In Avasant’s view, the Trump Administration’s proposed changes to work visa programs and travel entry rules will have a marked impact on the technology services industry. With respect to work visa programs, especially the H1-B visa, the Trump Administration initiatives will slow down but not completely stop the influx of foreign technology workers into the US to meet demand. The US has become skeptical of the H1-B program with respect to its use by IT outsourcing companies, but remains supportive of using it to recruit highly skilled positions requiring advanced degrees. The direction of the Administration’s Executive Orders and proposed immigration legislation in the US Congress suggest that reform of the H1-B program will likely involve the following: (1) increases to minimum salary thresholds; (2) changes to the visa allocation model to favor small business start-ups, advanced degree holders, and foreigners studying in US universities; and (3) improvements in auditing and enforcement of visa rules among US based companies.